As a driver, you are likely always on the lookout for small ways to improve your commute for both work and recreational activities. Regardless of your plans, it’s important to equip your ride with the best before you head down US-2. We understand the care put into North Dakota trucks, and we’re here to provide the best protection. Alpine Truck Accessories is proud to provide a full array of quality off-road parts to enhance the experience for drivers of all skill levels. Our local truck accessories equip drivers with the best protection in the industry, whether you’re investing in fender flares, skid plates, or so on. One product that many adventurers and commuters fail to capitalize on is the purchase of a truck bed cover. The Alpine team takes pride in delivering professional service to meet our top-notch products, and we are happy to customize your shopping list to best meet your needs and your budget while creating an off-road beast. Today, we’ll aim to inform consumers by highlighting a few key benefits associated with purchasing a tonneau cover for your truck. If you’re convinced that a bed cover will be a smart investment for your vehicle, be sure to stop by our truck shop in Williston! One benefit of covering your tonneau, or “open space in the back of the vehicle,” is that it will look clean and sharp. These products come in a variety of styles to best match your vehicle, including rollable soft materials, one-piece rigid covers, tri-fold options, retractable bed covers, and so on. What you’re left with is a smooth, consistent surface that conceals the dirt and rust of your previous adventures below. Modern advances now give drivers the option of buying tonneau covers that are flush with the side rails, with soft covers often profiling up to two inches over. A truck bed is valuable for storing luggage, tools, hunting equipment, or anything else that you take on the road with you. Unfortunately, inclement weather and strong winds can combine to create a concern for the integrity of your haul. A tonneau cover can be ideal for drivers that need full protection for their loads, be it sensitive computer equipment or mulch for the garden. You can breathe easy knowing that your property is safe from the elements. Beyond the effects of nature, you also want to protect your valuables and your truck from theft. North Dakota residents hoping to increase the security of their truck beds can benefit from the deterrence of a soft cover, but the rigid nature of hard tonneau covers does much to prevent ay casual crimes that may have developed while you were away. You can rest assured knowing that your cargo is private and protected. Most tonneau covers come with a locking key system to provide security that is comparable to the rest of your vehicle. Drivers that carry valuable cargo in their truck beds can benefit greatly from these security measures. Have additional concerns? No problem! Stop by our truck shop for the best advice, truck accessories, and bed covers in Williston! Working professionals and outdoor enthusiasts alike know the struggle of trying to keep your equipment neat and orderly throughout the day. Construction crews may leave the shop with a bed of tools and accessories ready to be used, but upon arrival at their destination, find that the wind and the travel have both made a mess of things. Objects such as paperwork, clothing, even hardware can be displaced by strong North Dakota winds, making it valuable to seek out a bed cover that can provide peace and protection in keeping your stuff organized. Going on a long road trip? Consider a tonneau cover to keep your goods in the truck bed where they belong! There are a lot of advantages to purchasing a tonneau cover for your vehicle. 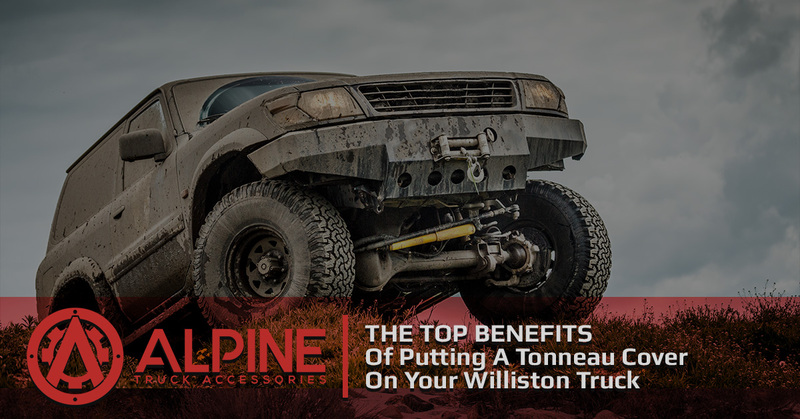 We understand the passion that truck owners have for their vehicles, and the team here at Alpine Truck Accessories is here to help you find the best enhancements for your off-road machine. Our experts proudly supply bed covers and truck accessories to Williston and beyond, relying on top-quality customer service with every transaction. Be sure to check in next time for part two of this series or contact us to learn more about our off-road parts!